Having a daughter in my house with Celiac Disease my family made the choice to go Gluten Free last year as to not cross contaminate my daughter. In the spring I was given the opportunity to review the book 150 Best Gluten-Free Muffin Recipes so I jumped at the chance and started experimenting with gluten free baking and the recipes. Not only does my family eat gluten free but the kids I look after usually eat our gluten free baking and have loved it. Keeping my fingers crossed that as I choose to experiment with gluten free baking they will continue to love it. From the book 150 Best Gluten-Free Muffin Recipes I made Chocolate Banana Teff Muffins. I made the muffins as instructed and they were so good. The banana added a punch to them that was great with the chocolate. These muffins didn't last long in our house both my daughter and all the kids loved them. I almost didn't get a chance to taste them. As I went through the book next on my to try list was the Sour Cream Peach Muffins. The sour cream made them so moist and I used fresh peaches diced up instead of frozen. Venturing into gluten free baking I was very fearful but as I have experimented with it and played with the flours a little bit I have come to find our favourite flour mixture and which flours we prefer. My daughter picked Cinnamon Sugar Muffins as she thought these would be a perfect morning treat. I have to say they were absolutely divine with my cup of tea in the morning, oh and my afternoon tea as well. These muffins do not have to be limited to morning eating they are an any time of day muffin for sure. 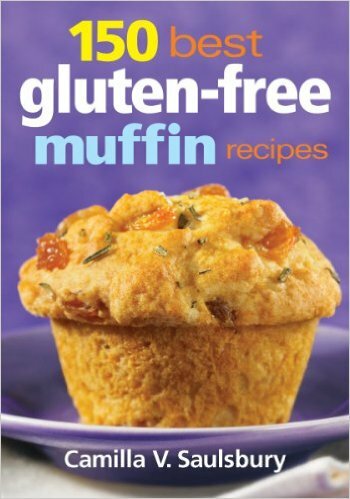 We will definitely be making more recipes from 150 best gluten-free muffin recipes by Camilla V. Saulsbury. I highly recommend this book as the recipes were easy to make and I found all the ingredients at my local store without having to hunt all over the place. With 150 recipes to go through it is a great addition to my collection of recipes book and it is a bonus that it is gluten free so we all can enjoy them.